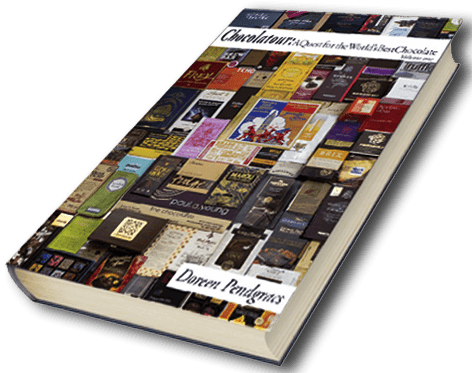 In this first volume of Chocolatour, author Doreen Pendgracs introduces you to chocolate masters in Belgium, France, Switzerland, Spain, Italy, and Holland, as well as the UK. She also takes you to cacao growing regions in Peru, Ecuador, and St. Lucia and includes a fascinating chapter on the health benefits of chocolate. Plus a global A-Z Chocolate Lovers’ Guide for the chocolate journey of your life. Buy direct from Doreen and get a personalized copy or purchase your copy via Amazon. Reduced prices are available on orders of 5 books or more. Contact Doreen. 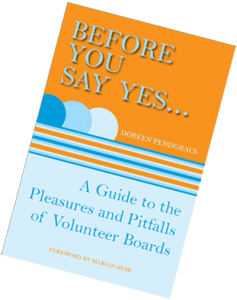 Doreen Pendgracs has sat on various boards of directors for more than twenty-five years. During that time, she has gleaned valuable information that she shares in an easy-to-understand, conversational style for novices and seasoned members alike. Whether you’re asked to sit on a trade union board, a non-profit board for a community group or church, a business-focused board of an association or chamber of commerce, or the board of a charitable organization, Before You Say Yes … gives you the inside scoop on what questions to ask and what you need to do before you take the plunge. Pendgracs leads the reader through the intricacies of management style, board etiquette and responsibilities, Robert’s Rules of Order, directors’ and officers’ insurance, and financial obligations and compensation. You’ll also discover what happens in the case of a lawsuit or how to implement a disaster plan, how to welcome new board members and deal with difficult people, and what benefits board membership can bring to your personal life and career. Buy direct from Doreen and get a personalized copy or purchase your copy via Amazon.